Stow-on-the-Wold is not the first place I would think of when engineering a long weekend away with seven children. It's a place I imagine more for coach trips of pensioners admiring the picture postcard scenery. Perhaps it's something to do with the town being home to the regular Sunday newspapers supplement free catalogue for Scotts of Stow. So it was with some trepidation that I embarked on our latest weekend away with the four cousins, two aunties and a grandma in tow. However, I was pleasantly surprised by the variety of attractions on offer. For our annual extended family trip away, we stay in a Youth Hostel in a different part of the country. Stow Youth Hostel is perfectly situated in the middle of the town square. We arrived late on the Friday morning and managed to check in just before it closed at midday. Once we'd made up our beds and dumped our bags, we enjoyed lunch in the Old Stocks Hotel next door to the hostel. Having sated our appetites we then explored our new surroundings on the Stow-on-the-Wold Town Trail, which cost 50p. While the historical facts were beyond the younger members of our group, they all enjoyed a turn in the town stocks and the older ones enjoyed looking out for the next building on the trail and learning a little bit about Stow's history. 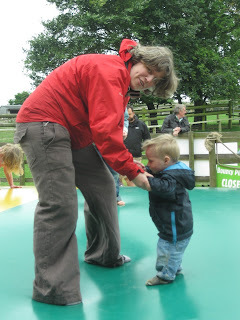 The highlight of our trip was a visit to Countryfile star, Adam Henson's Costwold Farm Park. There is plenty to amuse all ages, the children thoroughly enjoyed feeding the animals, including bottle feeding the young goats and sheep. There were plenty of play areas with an amazing bouncing pillow that even our 1 year old enjoyed, a tractor driving school and ride-on play tractors. Older members of the party also enjoyed an informative tractor safari around the grounds and a milking demonstration. On our last day, we visited the nearby Bourton-on-the-Water Model Village at the Old New Inn. This one ninth replica of Bourton-on-the-Water fascinated the whole family, although at times it was difficult to keep the toddlers on the path. I was very glad to have put my 1-year old in the sling as the village is definitely not buggy friendly. While we did see plenty of silver surfers on their coaches, the Cotswolds definitely caters for all generations. If you are planning a family stay-cation, the Cotswolds certainly delivers a wealth of attractions to suit all ages. Hi Zack, it's a picture of my nephew, so I'll check with his mum who blogs at http://inkspotsandgrassstains.blogspot.co.uk/ and will email you the response. Thanks for reading my blog.